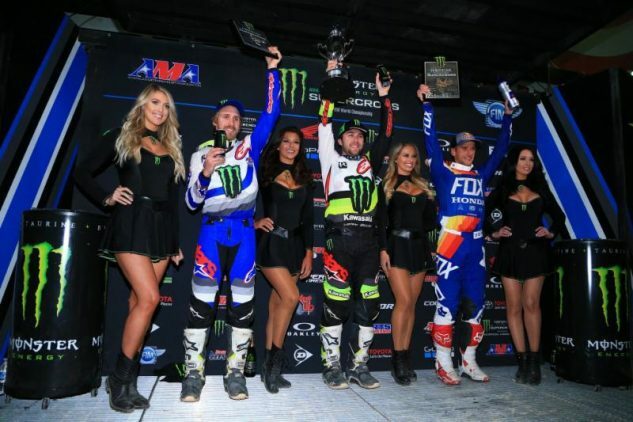 In the 250SX class, Monster Energy/Yamalube/Star/Yamaha’s Aaron Plessinger took the win and the red plate back from Monster Energy/Pro Circuit/Kawasaki’s Joey Savatgy and Troy Lee Designs/Red Bull/KTM’s Shane McElrath, who shared the points lead coming into round four. 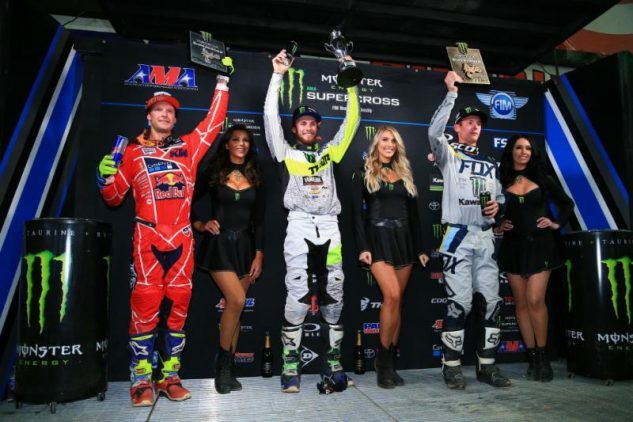 Things continue to get shaken up during this year’s Monster Energy AMA Supercross season. We’re looking forward to see what happens in Oakland next. 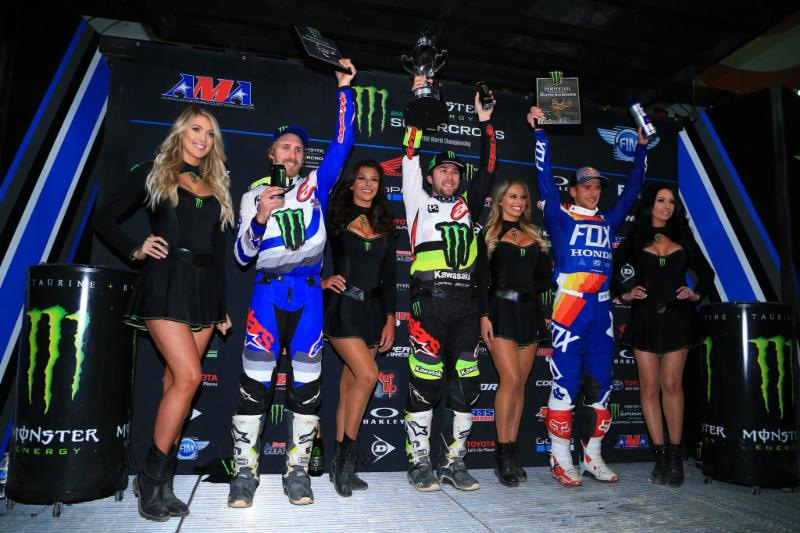 GLENDALE, AZ – January 28, 2018 – Monster Energy Supercross, an FIM World Championship, hosted Round 4 of the 2018 season inside the University of Phoenix Stadium in front of 54,623 fans. 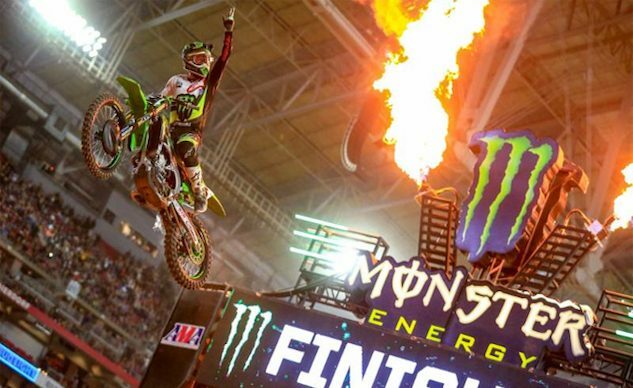 Monster Energy Kawasaki’s Eli Tomac scored his second consecutive overall event win in Glendale. 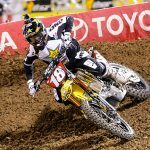 In the 450SX Class Main Event, Tomac captured the lead from the start and ran away with the win, leading all 23 laps ahead of Monster Energy/Knich/Yamaha Factory Racing’s Justin Barcia. The 450SX Class podium at Round 4 of the Monster Energy Supercross in Glendale, Arizona. 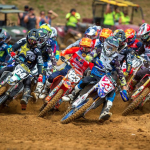 | Photo credit: Feld Entertainment, Inc.
Barcia earned his third podium with a second-place finish from the start, ahead of the battle for third. 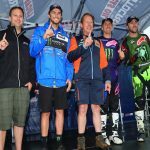 By the checkered flag, Team Honda HRC’s Ken Roczen captured third and his second podium of the season ahead of Rockstar Energy Husqvarna Factory Racing’s Jason Anderson. 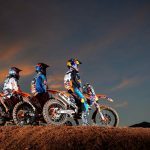 Team Red Bull KTM Factory Racing’s Marvin Musquin found a much-needed top five finish as he recovers from injury. In the 250SX Class Main Event, Monster Energy/Pro Circuit/Kawasaki’s Joey Savatgy and the Troy Lee Designs/Red Bull/KTM ride of Shane McElrath, who both came into the race with red number plates and tied in points, ran wheel-to-wheel ahead of the Monster Energy/Yamalube/Star/Yamaha Aaron Plessinger after the start. McElrath found an inside line on Savatgy and caught the lead until Plessinger found a way around both of them for the win and regained the points lead.